Very well kept apartment in one of La Pineda's most beautiful residences - close to the beaches. Very well kept apartment standing in one of the most beautiful residences of La Pineda with its 20.000 square metres of green zone, community swimming pools and sports facilities. Spacious and bright, this apartment is completely equipped; it counts with two double bedrooms (4 single beds), a complete bathroom with a shower, an independent equipped kitchen as well as a living room with a sofa-bed and direct way out to the nice corner furnished terrace (table + chairs + sunblind). For it to be easier for you, there is a private parking spot included already. This apartment stands in a family residence which, entirely laid out, has 2 community swimming pools, fountains paddle tracks, mini-gulf, petanque track, vast green zones and children playground. Completely landscaped, this residence is ideally located, close to the large fine sand beach of La Pineda and its maritime promenade, as well as from the centre of the seaside resort where you're made available all kinds of facilities (restaurants, bars, shops, supermarkets, chemists...) and activities (aquatic park Aquopolis, Aquum Spa centre...). Only 5 minutes drive from there, you'll get to the famous theme park Port Aventura in Salou, recently named best theme park all over Europe. 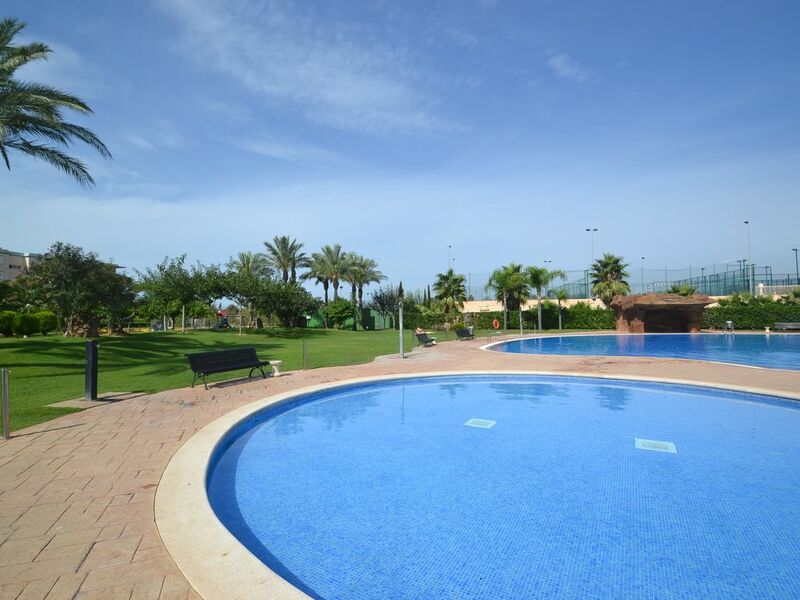 This apartment has an ideal situation, in one of La Pineda's most beautiful residences, with many activities -swimming pools, sports tracks, petanque, mini-golf, playgrounds, etc... - close to the beaches as well as to all kinds of facilities. Spacious, bright and well equipped, this apartment includes a private parking spot. Very functional, for 4 to 6 people: 2 double bedrooms + a sofa-bed in the living room - independent equipped kitchen - large furnished terrace. Beautiful residence, ideal for you to relax and enjoy as much as possible your holidays. A private parking spot is at your disposal, for free. This apartment counts with a nice living room with dining area, relax zone (TV - sofa-bed), ceiling fan and way out to the large corner terrace. This apartment has an independent fully equipped kitchen. In the living room there is a dining area. This apartment has a large corner terrace with views onto both the community area of the residence and the street (quiet) - it is furnished with table, chairs and sunblind. There is a mini-golf course in the residence. This property is absolutely perfect for you who want to relax and enjoy the numerous activities and visits which are available in the region. Fully equipped and in a completely laid out residence, just close up your suitcase and come. "Merci a HOMOLIDAYS de m'avoir proposé cette annonce de réve, 5/5 sur tout, propriétaire trés agréable merci beaucoup." QUAND nous sommes arrivés nous, nous sommes cruent au Club Med! piscine splendide, parking privée, vue agréable, proche de tous commerces! 200 metres de la plage, à 10 minutes de Port Aventura, et a 20 minutes a pied de "la pineda"..
appartement trés bien équipé,tous a portée de main! Je n'ai qu"un mot; SUPER! Très belle résidence qui comporte un parking souterrain privé. Les propriétaires sont très gentils.L'appartement est tout équipé proche de tous commerces, restaurants, parc de loisirs, boutiques, plage... La résidence comporte aussi une piscine et un jardin privé. C' est une location de rêve! Access by train: About 5 kms. from Salou's train station. Access by plane: About 15 kms. from Reus' airport and 95 kms. from Barcelona's airport.